HSIB’s investigation centred on how the error occurred and what recommendations could be made to reduce the risk of a similar event happening again. The investigation team observed similar surgical procedures in England and in Denmark as part of the investigation process. The investigation team worked collaboratively with organisations including the National Joint Registry, British Orthopaedic Association, NHS Improvement and the Department of Health and Social Care ‘Scan4Safety’ programme. 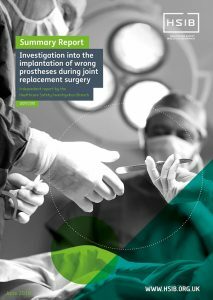 The investigation and final report was based on reviewing existing data, observations in operating theatres, interviews and clinical subject matter expertise. The report makes five safety recommendations, and one safety observation to support staff and to improve patient safety. This report is the first safety investigation report published by HSIB. There will be up to thirty investigations undertaken each year with safety recommendations published to mostly national bodies to ensure systemic learning that does not apportion blame or liability.